We had so much fun and they are already asking me what Lap Book they can start next!! 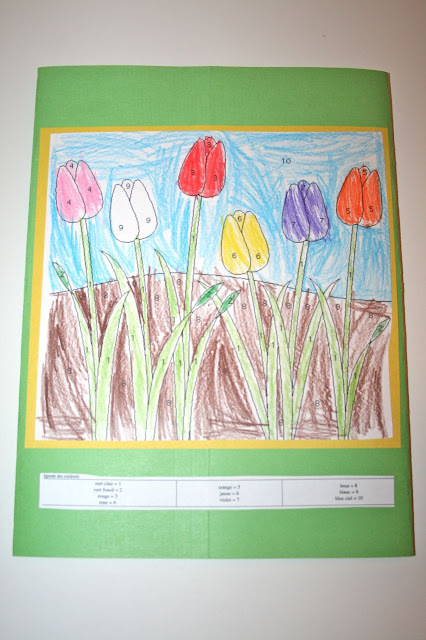 The picture of Madeline is from the coloring pages found here. On the left flap is the Eiffel Tower and a flag of France. 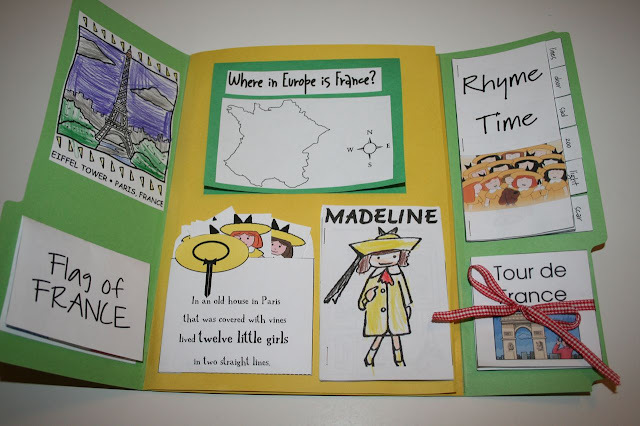 In the middle (on the top page) is Where in Europe is France (We located France and labeled the Atlantic Ocean), a pocket for the 12 girls, and a Madeline Coloring Book. 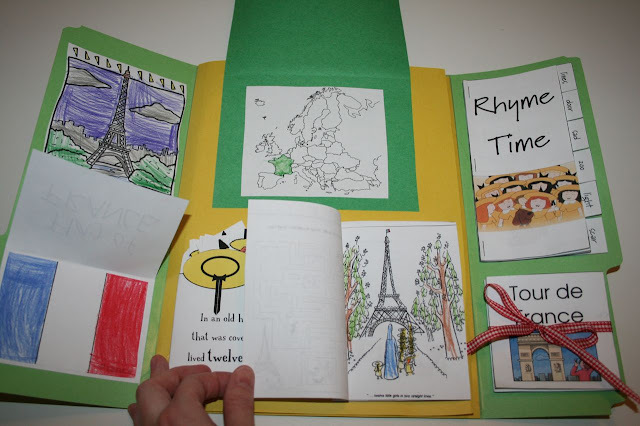 On the right flap we have our Rhyme Time mini book (with this image printed at 60% to cover the provided image), and the Tour de France book which pulls out and has photos of the various places you can find in the book. 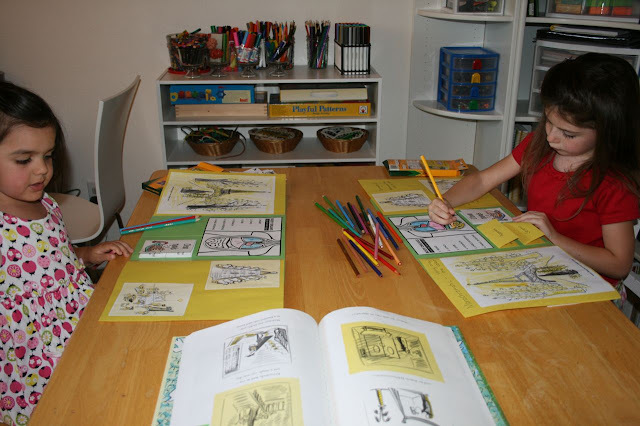 On the Left is the Definition of "Monochromatic" with a coloring page describing what Monochromatic means. 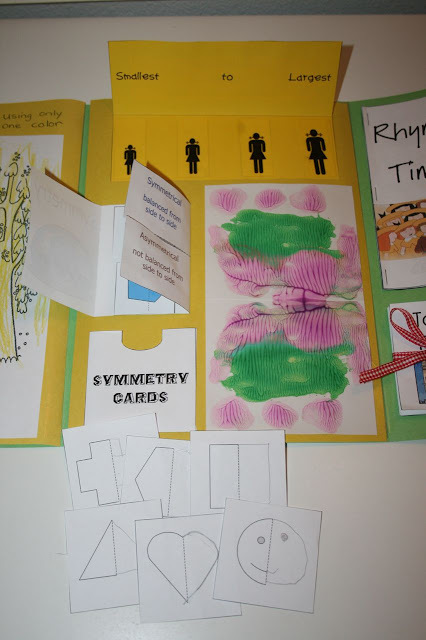 On the Right is a Relative Size Miniture Book, a mini book on Symmetry, Symmetry Cards, and a Symmetrical Painting. 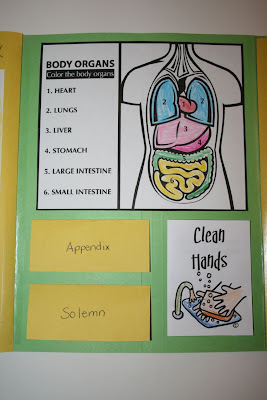 In the middle is our worksheet on the parts of the body, a mini book on clean hands/health, and he definitions for "appendix" and "solemn," a couple of the challenging words from the book. 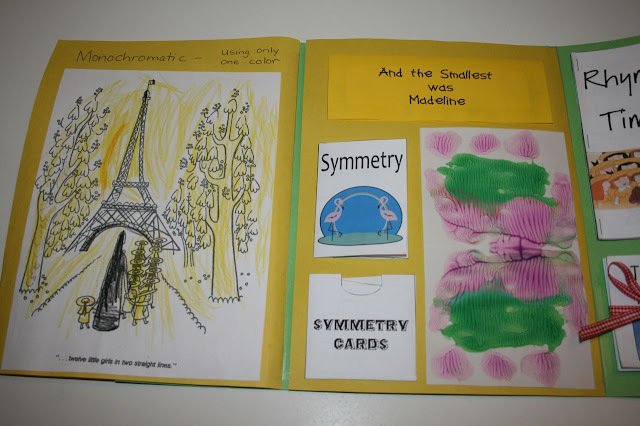 On the right are a couple pictures of the book which also demonstrate "symmetrical" and "asymmetrical." 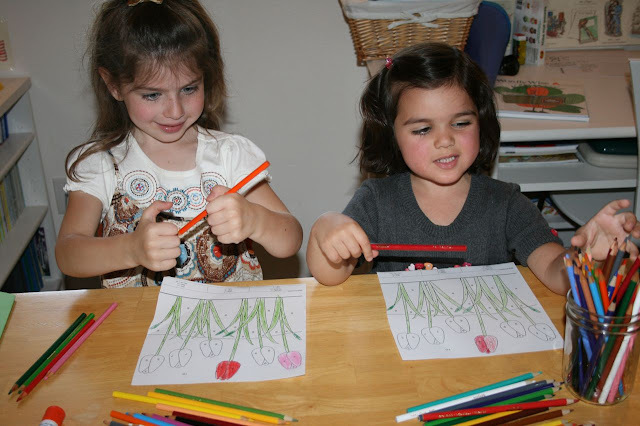 Did you know that Crayola Colored pencils have the colors listed in French as well as English?! My 10 year old still LOVES Madeline! 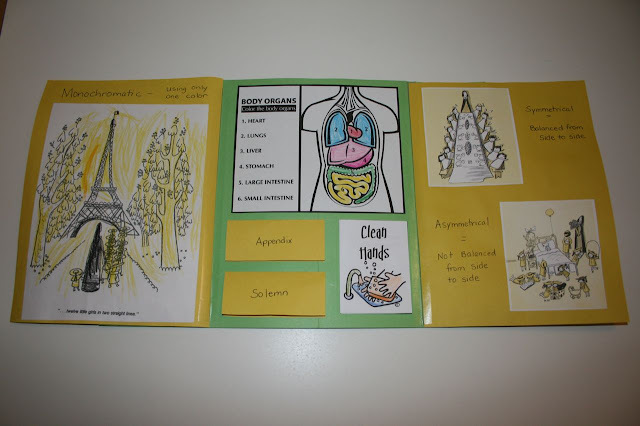 Lapbooks weren't really the thing 5 years ago when she was in Kindergarten, I think she might still enjoy doing some of this! Thanks for posting the links to the resources, and I LOVE the idea about the cake! By the way, we are studying the 50 states this year as well. I posted some links to a few resources and ideas I don't think you included. But if you're like me, you don't need ANY MORE inspiration or ideas! Not enough hours in the day! I've said it before and I'm sure I'll say it again--amazing! What beautiful memories the girls are making. I can't wait for Buttercup to be old enough to do this!!! 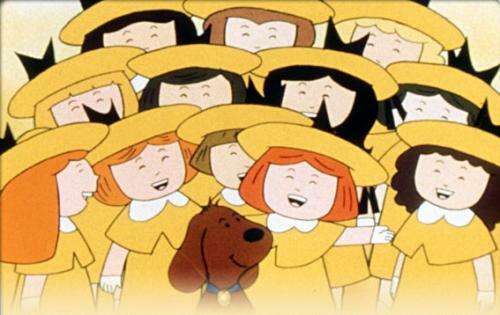 I adore Madeline! This was just fabulous Jessica! Great job girls! Just wondering if you print out everything on cardstock or not....I did almost all this time, because I hate the way the paper looks rumpled when you glue it on. What's your method? Sara ~ I use a rather heavy regular copy paper (24 lb) from Costco. For this lap book I only printed the Pocket for the 12 girls (and the girls too) and the Symmetry Cards on card stock. 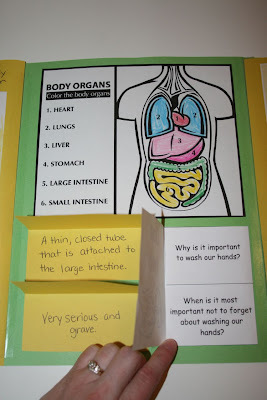 We also mounted a few things onto construction paper. This worked well and nothing looked rumpled after being glued. Oh! We use glue sticks too, which also really helps! So fun! My girls love Madeline! 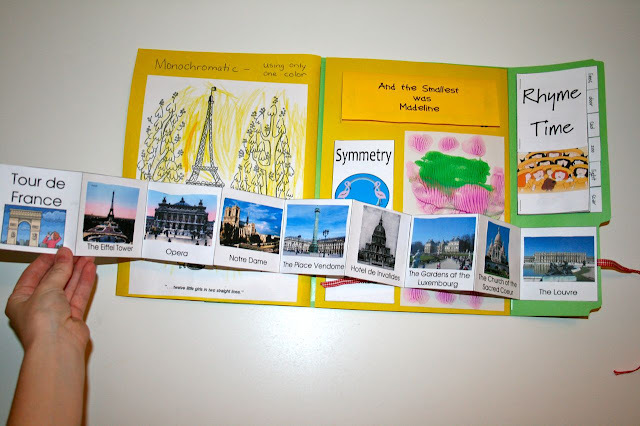 Thank you for sharing this great idea for a lap book! The symmetrical illustrations reminded me... has anyone else noticed that toward the end of the book where Madeline gets her appendix removed, there is an illustration of the other girls after they have visited her... they are shown eating, brushing their teeth, and going to bed. There are only 11 girls brushing their teeth, and Madeline's bed is empty... but when they are sitting at the table, all 12 girls are pictured, even though Madeline is still recovering in the hospital! Wonder how that happened? Is mine the only copy like that??? Looks like they had fun putting the lapbooks together!! What a great job! 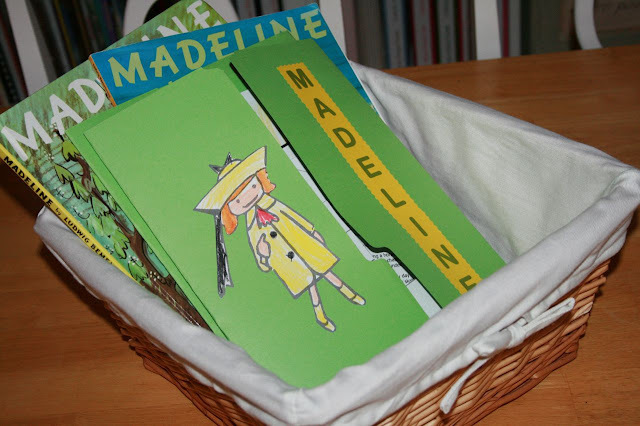 My kids and I will be reading and doing Madeline lapbooks this week. 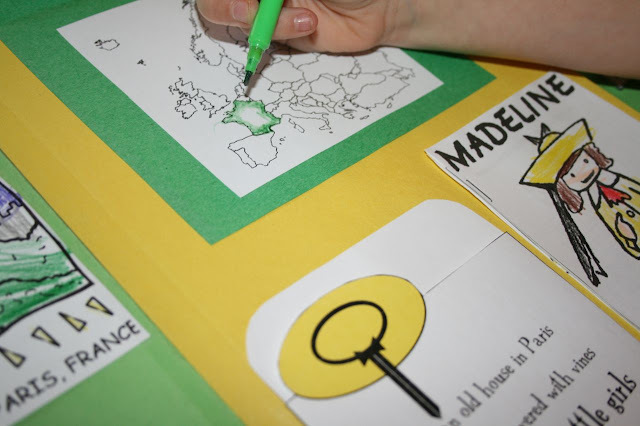 I am trying to find the 12 Madeline Girls, but have not been successful, can you direct me or share? I appreciate the help! momto2mnkys ~ You know, I am not finding it online anymore either. . . I do have a copy saved on my computer though, so if you send me an email (your return email isn't showing up with your comment) I can email you a copy. Yes, we just had a new baby and I'm even further behind than usual with answering comments and emails. :) I did see your first comment come through, but hadn't gotten around to approving the comments yet since they are all set to moderation. It's been 8 years since I did this project with my girls, but I think that I might still have the documents saved on an old computer (about 4 computers back, lol) that my high schoolers are using. If I can find them I'll upload them to my Dropbox and add a link to the top of this post. I might be able to do that this afternoon, but if not it might be a few days. We have a 10th birthday to celebrate tomorrow too!